lDepartments of Radiology (S.A.A. )mNeurology (S.A.A. )nNeurological Surgery (S.A.A. ), Northwestern University, Feinberg School of Medicine, Chicago, Illinois. SUMMARY: Intracranial vessel wall MR imaging is an adjunct to conventional angiographic imaging with CTA, MRA, or DSA. The technique has multiple potential uses in the context of ischemic stroke and intracranial hemorrhage. There remain gaps in our understanding of intracranial vessel wall MR imaging findings and research is ongoing, but the technique is already used on a clinical basis at many centers. This article, on behalf of the Vessel Wall Imaging Study Group of the American Society of Neuroradiology, provides expert consensus recommendations for current clinical practice. Conventional techniques for imaging the intracranial arteries are CTA, MRA, and DSA. These techniques reveal abnormalities of the vessel lumen, but they can fail to fully characterize disease that resides within the vessel wall. There has been growing interest in direct visualization of the vessel wall with high-resolution intracranial vessel wall MR imaging (VW-MR imaging). This technique is now used on a clinical basis at many centers. In 2012, the American Society of Neuroradiology formed a multidisciplinary study group to support the development and clinical implementation of VW-MR imaging. This article, on behalf of the study group, reviews the principles of intracranial VW-MR imaging and provides consensus recommendations for clinical practice. We make these recommendations with the recognition that there remain considerable gaps in knowledge and that research is ongoing. The American Society of Neuroradiology Vessel Wall Imaging Study Group is working with MR imaging vendors to promote the development and dissemination of commercial pulse sequences that are optimized for intracranial VW-MR imaging. Until such sequences are widely available, it is possible to adjust the scan parameters of existing sequences and obtain vessel wall images of sufficient quality for clinical use. Selection of sequences and scan parameters for VW-MR imaging is highly dependent on the particular scanner hardware and software available at a center. The technical sections that follow provide general recommendations on the development of an intracranial VW-MR imaging protocol, and we are also launching a dynamic document (via the American Society of Neuroradiology Web site) through which experienced centers can describe their MR imaging systems and the specific pulse sequences and scan parameters that they have found useful. The principal technical requirements for intracranial VW-MR imaging are the following: 1) high spatial resolution, 2) multiplanar 2D acquisitions or 3D acquisitions, 3) multiple tissue weightings, and 4) suppression of signal in luminal blood and CSF. The normal middle cerebral artery and basilar artery wall thickness is 0.2–0.3 mm, which is approximately one-tenth of the luminal diameter1 and smaller than the VW-MR imaging voxel dimensions currently achievable. However, it is possible to image the intracranial arterial wall because the wall generates detectable MR imaging signal and one can suppress the MR imaging signal arising from neighboring blood and CSF within the voxel. In addition, vessel wall disease often results in wall thickening, which increases its conspicuity. Technical implementation of VW-MR imaging. Comparison of a coronal 2D T1-weighted FLAIR VW-MR imaging sequence (A) and a 3D proton-density–weighted variable flip angle refocusing pulse, fast spin-echo VW-MR imaging sequence (B) in a healthy subject. Insets show magnified images of the carotid terminations with arrows pointing to the arterial wall. Comparison of a standard contrast-enhanced T1-weighted spin-echo sequence (C) and an optimized contrast-enhanced T1-weighted VW-MR imaging sequence (D) shows how blood suppression is needed to reveal an enhancing atherosclerotic plaque (arrow) in the left MCA M1 segment. Accurate interpretation of VW-MR imaging requires visualization of the vessel wall in both short- and long-axis planes. One option is to use 2D sequences multiple times in orthogonal planes, focusing on the particular vessels of interest. A limitation of this approach is that most intracranial arteries are curved rather than straight and vessel obliquity and curvature can result in partial volume averaging effects,4 which confound the appearance of the arterial wall. Another option is to use a 3D (volumetric) sequence and then reformat the isotropic data for viewing in multiple 2D planes. The 3D approach reduces total scan time and provides more flexibility because any imaged vessel can be viewed in any reformatted plane. However, some groups have found that current 2D sequences provide better image quality when imaging is targeted to a particular vessel of interest. An optimal VW-MR imaging protocol may include both 2D and 3D sequences. Time-of-flight MRA is mainly used to characterize luminal abnormality and act as a localizer for subsequent vessel wall sequences. Low-velocity flow can cause intravascular signal loss on time-of-flight MRA, so in patients who have pronounced luminal narrowing or dilation, it is helpful to add a gadolinium-bolus MRA to accurately define the contour of the lumen (ie, the boundary between the lumen and wall). Most examinations require a T1-weighted vessel wall sequence before and after intravenous gadolinium contrast. It is possible to use a proton-density–weighted sequence instead of a T1-weighted sequence because the former provides higher SNR. The disadvantages of proton-density weighting are that contrast enhancement may be less conspicuous and CSF signal intensity can approach vessel wall intensity. A T2-weighted VW-MR imaging sequence is often helpful. 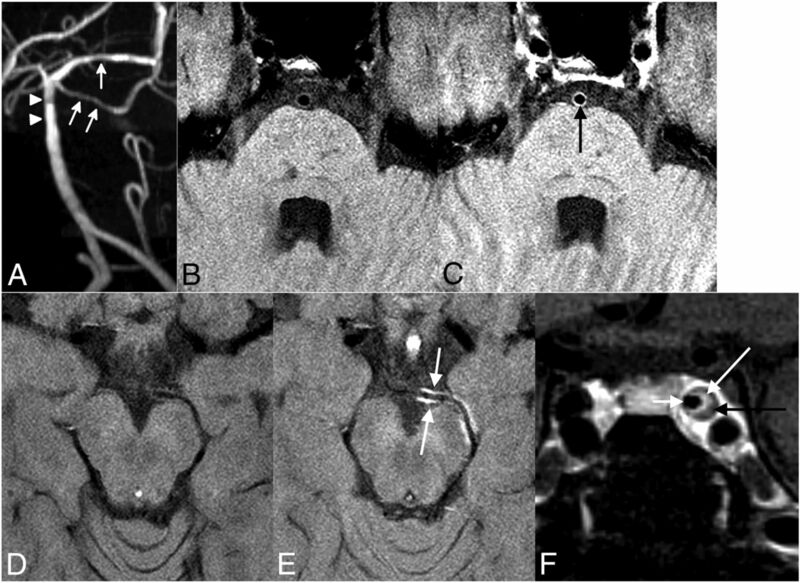 Fat suppression is necessary for VW-MR imaging of the external carotid artery branches in the scalp (eg, in patients with suspected temporal arteritis) but is generally not needed for intracranial VW-MR imaging. A spatially selective pulse tips a thick slab of spins on either side of the imaging section into the transverse plane, and then a spoiling gradient dephases this transverse magnetization.5 The dephased spins flow into the imaging section, where they are exposed to an excitation pulse, but they are not able to regain phase in the transverse plane until they have undergone longitudinal relaxation, so they do not yield signal. This technique exploits both the flow and T1 properties of blood to suppress its signal.6 A 180° non-section-selective pulse inverts all spins. A section-selective 180° pulse, applied immediately after the first pulse, flips the imaging-section magnetization so it is realigned with the main magnetic field. There is then a time delay (TI), which allows inflowing inverted spins to relax to their null point; and at the expected null point for blood, another pulse is applied to generate an echo for readout. Only the stationary spins in the imaging section return signal. A disadvantage of the technique is that the time needed for spins to reach the null point lengthens the scan time, making it challenging to cover vessels of interest with sufficient spatial resolution for intracranial VW-MR imaging. The most commonly used 3D sequences for intracranial VW-MR imaging are the variable flip angle refocusing pulse, fast spin-echo sequences7 with brand names such as VISTA (volume isotropic turbo spin-echo acquisition; Philips Healthcare, Best, the Netherlands), SPACE (sampling perfection with application-optimized contrasts by using different flip angle evolutions; Siemens, Erlangen, Germany), and Cube (GE Healthcare, Milwaukee, Wisconsin). These sequences have very long echo trains, a potential source of imaging blurring from decay of transverse magnetization between the start and end of the readout. These sequences minimize this blurring by varying the flip angle over the length of the echo train to maintain relatively stable signal. Most centers are currently performing intracranial VW-MR imaging without peripheral pulse gating. Pulse gating is potentially useful for VW-MR imaging of dilated intracranial arteries or large aneurysms in which gating to the point of maximum flow in the vessel may reduce the artifacts associated with slow flow and improve blood suppression. When using 2D sequences, some groups monitor the examination and select the sequences and scan planes that will optimally show the vessels of interest. When using 3D sequences, monitoring is less critical but still sometimes helpful to determine coverage and select sequences. VW-MR imaging of intracranial atherosclerotic plaque typically demonstrates arterial wall thickening, which eccentrically (nonuniformly) involves the circumference of the arterial wall. The component of the plaque adjacent to the lumen is often hyperintense on T2-weighted images, and it may enhance (as discussed below), whereas the adjacent component is often hypointense on T2-weighted images and nonenhancing (Fig 2F).16⇓⇓⇓⇓⇓–22 There is sometimes a third thin layer in the periphery of the plaque that enhances. This layered appearance of intracranial atherosclerotic plaque correlates with the VW-MR imaging appearance of carotid atherosclerotic plaque, and carotid endarterectomy specimens have shown that the enhancing layer adjacent to the lumen represents fibrous cap, the nonenhancing layer adjacent to this represents lipid core, and the peripheral thin rim of enhancement is due to increased vasa vasorum in the adventitia of the artery.23⇓–25 Not every intracranial atherosclerotic plaque demonstrates all of these components on VW-MR imaging; for example, some plaques simply have the appearance of an eccentric homogeneously enhancing “lump” in the arterial wall. In addition, as we will discuss, not every intracranial plaque enhances. VW-MR imaging to differentiate among causes of intracranial arterial stenosis when angiography findings are inconclusive. This patient had multiple recent infarcts in the pons. MR angiogram (A) demonstrates short segments of mild narrowing of the distal basilar artery (arrowheads) and left superior cerebellar and posterior cerebral arteries (arrows). Axial T1-weighted VW-MR imaging before (B) and after (C) intravenous contrast injection shows smooth concentric enhancement of the basilar artery wall (arrow). VW-MR imaging before (D) and after (E) contrast injection shows similar enhancement of the left posterior cerebral artery wall (arrow). The vessel wall appearance is consistent with the final diagnosis, which was primary CNS vasculitis. For comparison, coronal contrast-enhanced T1-weighted VW-MR imaging (F) in a different patient shows characteristic features of an atherosclerotic plaque: eccentric arterial wall thickening with a contrast-enhancing fibrous cap (long white arrow) and peripheral nonenhancing plaque (black arrow). A short white arrow points to the arterial lumen. Visualization of the wall of the smaller intracranial vessels is beyond the spatial resolution and SNR limits of current VW-MR imaging. However, CNS vasculitis often involves larger intracranial arteries that are amenable to wall imaging. VW-MR imaging often demonstrates smooth, homogeneous, concentric arterial wall thickening and enhancement in patients with CNS vasculitis (Fig 2A–E), in comparison with the typical nonconcentric (and often heterogeneous) wall abnormality of atherosclerotic plaque (Fig 2F).19,27,28 However, subsequent experience has shown that vasculitis sometimes also results in eccentric wall abnormality.29 The additional vessel wall features of atherosclerotic plaque on T1-, T2-, and enhanced sequences can be helpful for distinguishing between vasculitis and plaque. Early discrimination between reversible cerebral vasoconstriction syndrome (RCVS) and its principal differential, vasculitis, is important: RCVS is treated with observation or calcium channel blockers, whereas vasculitis is treated with steroids and immunosuppressive drugs. VW-MR imaging may enable prospective differentiation between vasculitis and vasoconstriction.32 Both disorders result in arterial wall thickening, but the vessel wall in RCVS is typically nonenhancing (or mildly enhancing) compared with the typical intense wall enhancement in active vasculitis.29,32,33 Arterial wall thickening with a lack of wall enhancement is consistent with the pathology of transient vasoconstriction. In vasospastic arteries, smooth-muscle cells shorten in length with increased overlap among cells, resulting in nearly a 500% increase in wall thickness for a 60% luminal narrowing.32,34 Lack of arterial wall enhancement is concordant with the limited histopathologic data in RCVS, showing an absence of arterial wall inflammation.32,35,36 We have seen some individual cases that appear to be RCVS with more than minimal wall enhancement, so we recommend caution in relying strongly on VW-MR imaging discrimination between RCVS and vasculitis until this approach is validated in a larger study. Some study group members have also observed a crenelated appearance of arterial wall thickening in RCVS. Initial VW-MR imaging studies of small numbers of patients with Moyamoya disease found a lack of arterial wall thickening and enhancement19,37; and a study found a smaller outer diameter of the vessel wall, less eccentricity of wall thickening, and less wall enhancement in patients with Moyamoya disease compared with atherosclerotic plaque.38 Atherosclerotic plaque may undergo negative remodeling with reduction of the outer diameter of the vessel, but this seems to differ from Moyamoya disease, in which the MCA trunk is not visible at all in some cases, the so-called “vanishing MCA.”39 These VW-MR imaging findings are consistent with histopathologic studies showing thinning of the arterial media and a paucity of inflammatory cells in the vessel wall of patients with Moyamoya disease.40 However, a subsequent study41 found a considerably higher frequency of concentric internal carotid and middle cerebral artery wall enhancement in patients diagnosed with Moyamoya disease and, perhaps surprisingly, no difference in vessel wall enhancement between early and late angiographic stages of the disease. Further research is needed to resolve the discordance among studies. It will remain important to accurately differentiate between Moyamoya disease and the multitude of other causes of narrowing at the carotid terminus. There is limited experience with the VW-MR imaging appearance of radiation-induced intracranial arteriopathy. A study37 of 5 patients with radiation-induced narrowing of the intracranial internal carotid arteries found circumferential arterial wall thickening and enhancement in all cases. Follow-up MR imaging 2 years later demonstrated persistence of the enhancement. Intracranial arterial dissection most often occurs as an extension of cervical vertebral artery dissection. However, it can also occur as an extension of cervical internal carotid artery dissection or as an isolated intracranial abnormality. VW-MR imaging features of intracranial arterial dissection include a curvilinear hyperintensity on T2-weighted images (intimal flap) separating the true lumen from the false lumen and eccentric arterial wall thickening with the signal characteristics of blood (intramural hematoma) (Fig 3).42 A VW-MR imaging study43 of 67 patients with intracranial arterial dissection suspected on CTA, MRA, or DSA found an intimal flap on luminal imaging in 16% of patients and on VW-MR imaging in 42%. VW-MR imaging demonstrated intramural hematoma in 61% of patients, with 83% of the visible hematomas evident on T1-weighted images and 59% evident on T2-weighted images. The vessel wall abnormality had a layered appearance on contrast-enhanced T1-weighted images, with enhancement along the luminal and peripheral margins of the artery wall in 51% of patients. VW-MR imaging to identify symptomatic, nonstenotic intracranial atherosclerotic plaque. A 52-year-old man with a previous transient ischemic attack attributable to the right middle cerebral artery territory presented with an acute infarct (A) in the same vascular territory. Cardiac work-up, CT angiography of the head and neck and DSA (B and C) and cervical carotid VW-MR imaging failed to identify a cause of the stroke. Sagittal-oblique contrast-enhanced T1-weighted VW-MR imaging of the supraclinoid segment of the right ICA (D) shows eccentric arterial wall thickening (arrows) with enhancement (dotted arrow) in the more luminal aspect of the thickening, consistent with the fibrous cap of a recently symptomatic plaque. Sagittal-oblique T2-weighted VW-MR imaging (E) shows T2 prolongation (arrow) in the more luminal aspect of the thickening and T2 shortening peripherally, consistent with the fibrous cap and lipid core of atherosclerotic plaque, respectively. The arterial wall thickening without luminal narrowing is so-called positive remodeling of the vessel wall. In 15 patients with an acute lacunar infarct, normal angiography findings, and no other apparent cause of stroke, VW-MR imaging demonstrated enhancing atherosclerotic plaque in the supplying (middle cerebral or basilar) artery in 9 (60%) patients.49 Similar studies have shown VW-MR imaging evidence of atherosclerotic plaque in the supplying artery of 52% of patients with MCA territory lacunar infarcts and 42% of patients with pontine infarcts, but normal MRA findings.50,51 A VW-MR imaging study52 that assessed the prevalence of MCA plaque both ipsilateral and contralateral to lenticulostriate territory infarcts in patients who had normal MRA findings found a similar prevalence (46% and 45%, respectively) bilaterally. This latter study did not report whether there was a difference in contrast enhancement between the plaques ipsilateral versus contralateral to the infarction. Figure 3 demonstrates VW-MR imaging identification of a culprit plaque when angiographic findings are normal. Study group members have also found that VW-MR imaging can help diagnose cases of CNS vasculitis and arterial dissection with minimal arterial luminal abnormality. 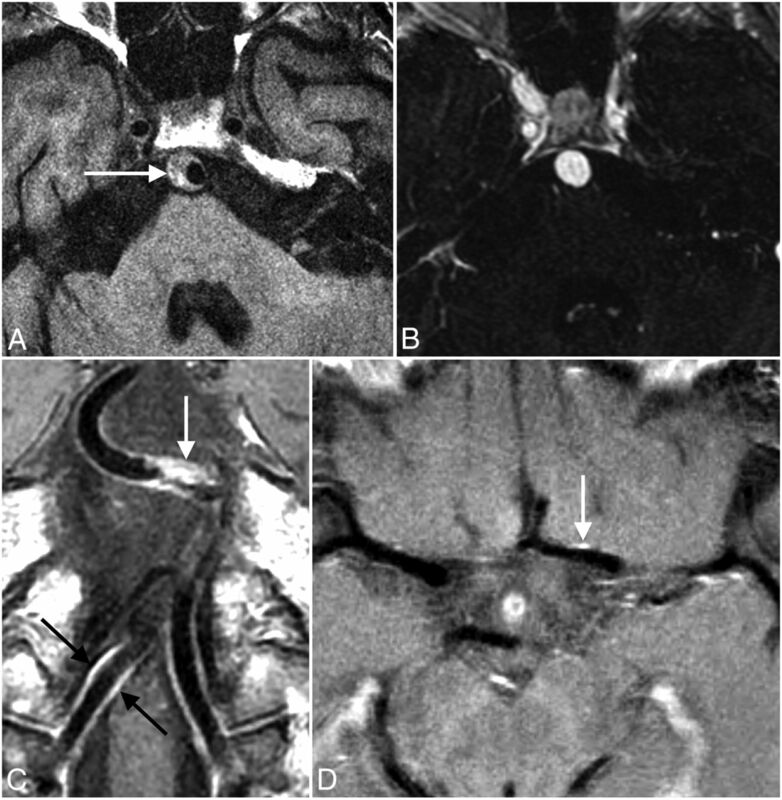 Figure 4 demonstrates VW-MR imaging diagnosis of symptomatic intracranial arterial dissection in the context of a CTA considered equivocal for luminal narrowing. 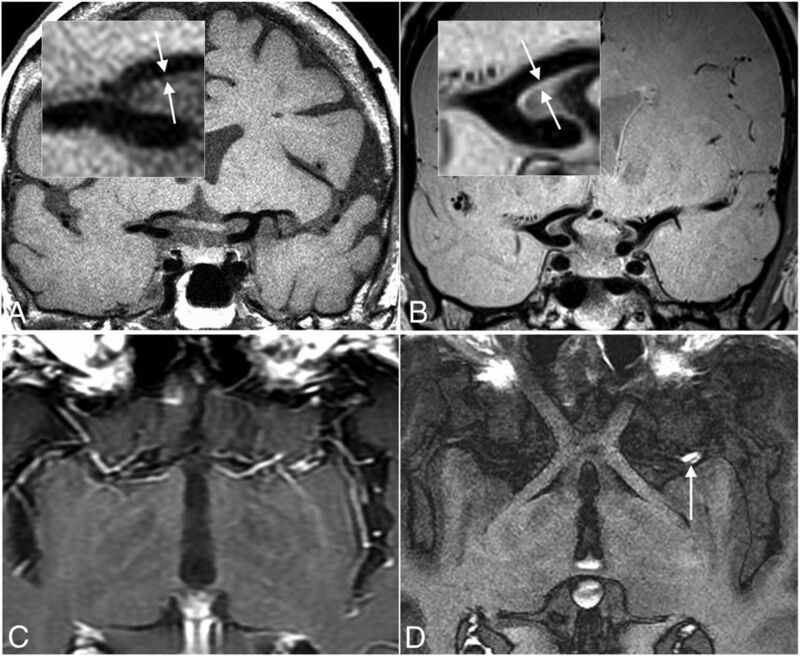 VW-MR imaging to diagnose intracranial arterial dissection with minimal luminal narrowing. A 57-year-old man presented to the emergency department with severe headache and neck pain for 1 week. 3D rendering of a CTA shows smooth narrowing of the intradural segment of the right vertebral artery (A, arrows). This angiographic appearance was considered most likely within the range of normal because the vertebral artery is commonly narrower beyond the posterior inferior cerebellar artery origin, but a bit equivocal. Coronal (B) and axial (C) nonenhanced T1-weighted VW-MR imaging shows eccentric intense hyperintensity (B and C, arrows) in the wall of the right vertebral artery, consistent with recent arterial dissection. Higher risk intracranial atherosclerotic plaque shares pathologic features with higher risk carotid plaque.59 Several imaging features may indicate higher-risk plaque. Plaque Thickness and Surface Irregularity. Atherosclerotic plaque often results in outward bulging of the outer surface of the artery.62 This has been called compensatory enlargement (“adaptive remodeling” or “positive remodeling”) because it can lessen the luminal narrowing caused by the plaque. In the coronary arteries, positive remodeling is more common in plaques that contain hemorrhage and inflammation63; this feature suggests that positive remodeling is an indicator of higher risk vessel wall pathology. Other plaques are associated with reduction of the outer diameter of the artery (“negative remodeling”),64 and this may reflect a fibrotic healing response. Most VW-MR imaging studies20,61 have found that MCA remodeling was (on average) outward in symptomatic plaques and inward in asymptomatic plaques, though some studies16 have found no significant difference. Microembolic signals on transcranial Doppler sonography were more common in patients with MCA atherosclerotic plaque with VW-MR imaging evidence of positive remodeling,65 consistent with the idea that positive remodeling is characteristic of the higher risk plaque that produces thromboembolism. A postmortem study of MCA atherosclerosis found intraplaque hemorrhage in 30% of plaques associated with an infarct compared with 15% of plaques not associated with an infarct (P = .07).66 A VW-MR imaging study of 107 adults with >70% MCA stenosis found that T1 shortening (thought to indicate intraplaque hemorrhage) was more common in symptomatic than in asymptomatic plaque (20% versus 2%, P = .01).66 Another study reported a higher prevalence of intraplaque T1 shortening in symptomatic-versus-asymptomatic MCA plaques (27% versus 0%, P = .002).60 In a research context, a signal intensity of >150% of the signal intensity of adjacent gray matter60 or scalp muscle66 on a T1-weighted sequence has been used as a criterion for defining intraplaque hemorrhage. Several study group members have observed a much lower prevalence of intracranial intraplaque hemorrhage than the values reported in the literature, possibly due to different patient populations or timing of the scans relative to symptom onset. Contrast enhancement of carotid bulb atherosclerotic plaque occurs preferentially in the fibrous cap and adventitia (though sometimes in the middle of the plaque) and is a marker of inflammation and neovascularization.25,67⇓–69 A postmortem study59 found that neovascularity in MCA atherosclerotic plaque was associated with ipsilateral infarction. VW-MR imaging studies19,70,71 have shown that intracranial plaque enhancement is associated with recent infarction in the territory of the plaque. A study of the temporal characteristics of intracranial plaque enhancement found strong enhancement within 1 month of ischemic stroke and reduced enhancement several months later.72 Another study73 found no difference in enhancement when comparing patients with acute stroke versus those with stroke any time in the preceding 3 months, which is not inconsistent with the former study, which found that enhancement did not lessen until a few months after the acute event. In some intracranial plaques, one can identify the enhancing fibrous cap and enhancing adventitia as distinct layers on either side of an intervening nonenhancing layer, but (possibly due to the limited spatial resolution of VW-MR imaging relative to the size of intracranial plaques) plaques often appear to enhance diffusely or not at all. Extracranial VW-MR imaging has been used to identify an inflamed segment of the superficial temporal artery and guide arterial biopsy to diagnose giant cell arteritis.78 There is a lack of high-quality data on the sensitivity and specificity of brain (or leptomeningeal) biopsy for the diagnosis of CNS vasculitis. However, CNS vasculitis can be spatially heterogeneous, and false-negative biopsies occur. Study group members have found that VW-MR imaging is a potential means of identifying a peripherally located inflamed vessel to target for biopsy. A VW-MR imaging study81 of 5 patients with aneurysmal subarachnoid hemorrhage found that all ruptured aneurysms demonstrated thick peripheral enhancement. Three patients in this series had multiple aneurysms, and the unruptured aneurysms did not enhance. A subsequent study82 confirmed these findings in a larger sample size: There was aneurysm wall enhancement in 16/17 ruptured aneurysms; enhancement in 5/5 unruptured aneurysms that had changed in morphology compared with a previous angiogram; and enhancement in 6/9 symptomatic unruptured aneurysms; but wall enhancement in only 22/77 unruptured, asymptomatic, stable aneurysms. Another study10 had similar results. Figure 5 provides an example of VW-MR imaging in a patient with 2 aneurysms, 1 unruptured and 1 ruptured. VW-MR imaging to evaluate vascular disease activity. MR angiogram demonstrates a saccular aneurysm at the tip of the basilar artery (A) and a saccular aneurysm at the right posterior communicating artery origin (C). Coronal contrast-enhanced T1-weighted VW-MR imaging shows no enhancement of the basilar artery aneurysm wall (B, arrow) but intense enhancement of the posterior communicating artery aneurysm wall (D, arrow). Axial T2-weighted FLAIR image (E, arrow) demonstrates a hematoma centered around the enhancing aneurysm, consistent with the preliminary research studies, suggesting that symptomatic and ruptured aneurysms have wall enhancement much more commonly than asymptomatic saccular aneurysms. There has also been interest in using VW-MR imaging to determine the source of hemorrhage in patients with angiogram-negative non-perimesencephalic subarachnoid hemorrhage,83 but no evidence yet of utility. A study of human aneurysm tissue found diffuse invasion of macrophages and leukocytes into the vessel wall of ruptured aneurysms but few inflammatory cells in the wall of unruptured aneurysms.84,85 These inflammatory changes were already present shortly after the rupture and were not more pronounced when there was greater time between aneurysm rupture and surgical excision, suggesting that aneurysm wall inflammation might precede rupture rather than occur as a result of rupture.84 If aneurysm wall inflammation is an important factor in aneurysm growth and rupture, then vessel wall enhancement may be a marker of rupture risk. However, prospective longitudinal studies are needed to prove that this is correct. There is also interest in measuring aneurysm wall thickness to predict rupture risk. However, berry aneurysm wall thickness is approximately 0.02–0.5 mm,86 leading to overestimation of wall thickness from the partial volume effects that will occur at the spatial resolutions currently achievable.87 It is not yet possible to accurately measure berry aneurysm wall thickness by using VW-MR imaging. Accurate diagnosis by using VW-MR imaging is critically dependent on both an adequate imaging technique and interpretive experience. When either of these is lacking, normal variations are easily misinterpreted as disease. Common VW-MR imaging pitfalls. Case 1 (A and B) shows how slow flow can mimic arterial wall disease. Axial nonenhanced T1-weighted VW-MR imaging (A) demonstrates a crescent (arrow) of intermediate-to-hyperintense signal at the periphery of the basilar artery, suggestive of arterial wall thickening from dissection or atherosclerotic plaque. A corresponding image from a gadolinium-enhanced MRA (B) shows that the crescent of apparent arterial wall thickening fills with contrast and therefore represents a dilated basilar artery lumen rather than the arterial wall. Case 2 (C) shows how vasa vasorum can mimic vasculitis. Coronal contrast-enhanced T1-weighted VW-MR imaging shows a focal atherosclerotic plaque (white arrow) of the basilar artery, but also more diffuse smooth concentric enhancement of the vertebral (black arrows) and basilar artery walls, which has an appearance similar to that of vasculitis. The diffuse enhancement is consistent with increased intracranial vasa vasorum in this patient who has strong atherosclerotic risk factors. Case 3 (D) shows how a normal vein residing close to an artery can mimic arterial wall disease, such as enhancing atherosclerotic plaque. Axial contrast-enhanced T1-weighted VW-MR imaging shows a vein (arrow) adjacent to the left middle cerebral artery. The walls of major extracranial arteries receive blood supply through the vasa vasorum, a network of small vessels within the outer aspect of the vessel wall itself. Intracranial vessels in children lack a vasa vasorum.89 However, with increasing age and with atherosclerotic risk factors, extracranial vasa vasorum can extend into the proximal intracranial segments of the internal carotid and vertebral arteries.90 In patients with a variety of intracranial arterial diseases, a vasa vasorum can also develop distant from the extracranial vasa vasorum, with supply from nearby intracranial arteries.91 A vasa vasorum can cause concentric arterial wall thickening and enhancement,92 which mimic vasculitis (Fig 6C). An enhancing vein located adjacent to an artery can mimic arterial wall enhancement (Fig 6D). It is usually possible to avoid this by careful examination of VW-MR imaging in multiple planes and comparison with MR angiography. Does thromboembolism itself injure the arterial wall and change the appearance of the wall? Does mechanical thrombectomy alter the appearance of the wall? These issues were explored in a VW-MR imaging study of 16 patients imaged within days of acute intracranial arterial occlusion.93 The cause of stroke was an extracranial source of thromboembolism in most cases, and the intracranial arteries had fully recanalized at the time of VW-MR imaging in most cases. 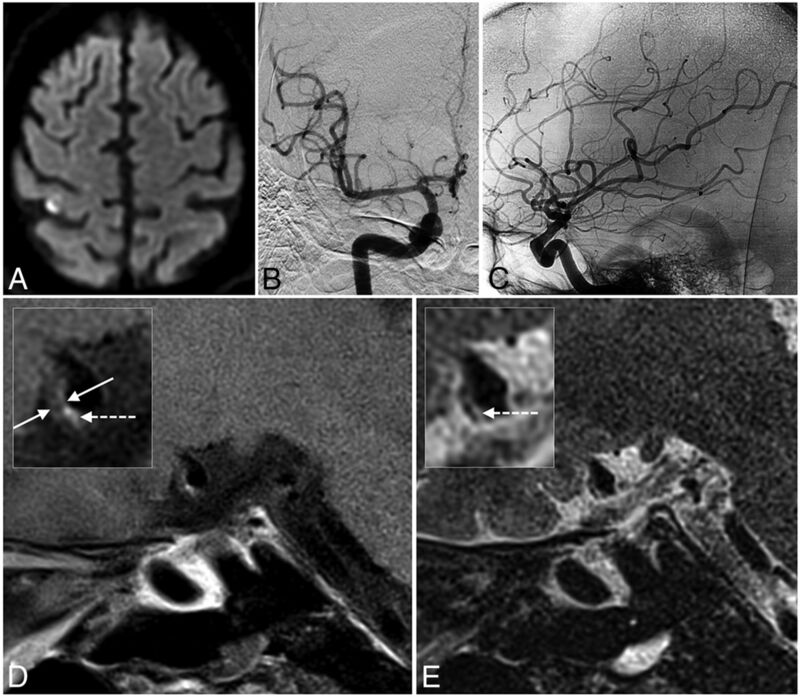 The study found that mechanical thrombectomy results in concentric intracranial arterial wall thickening and enhancement, potentially mimicking the VW-MR imaging appearance of primary arteritis. A similar arterial wall abnormality was observed in patients treated with medical therapy alone, but it was less common in this group. To differentiate among causes of intracranial arterial narrowing such as intracranial atherosclerotic plaque, vasculitis, reversible cerebral vasoconstriction syndrome, and arterial dissection. To determine the location of atherosclerotic plaque relative to branch artery ostia. Use pulse sequences that provide sufficient spatial resolution, black blood, and preferably black CSF. Use 2D sequences in short- and long-axis planes through the vessels of interest, and/or 3D sequences with isotropic voxel dimensions and multiplanar reformatting. Modify the VW-MR protocol in response to the particular clinical indication. Protocols will often include a time-of-flight MRA of the circle of Willis, T1-weighted (or proton-density–weighted) vessel wall sequences before and after intravenous administration of gadolinium, and T2-weighted sequences. Consider adding a gadolinium-bolus MRA, particularly if there is severe arterial narrowing or arterial dilation. Recognize that the true performance capabilities of MR images are often unclear and important characteristics such as spatial resolution depend on multiple factors and not simply voxel size. Therefore, quantitative measurements (such as vessel wall thickness) should be validated against calibration standards by using phantom testing. Interpret VW-MR imaging using the fundamental principles of radiologic interpretation used in other body tissues. Confirm vessel wall findings in multiple planes and preferably with multiple tissue weightings, and combine information from all available sequences to determine whether there is vessel wall thickening or enhancement. This assessment requires accurate determination of the inner and outer boundaries of the vessel wall by direct comparison of T1-, T2-, and contrast-enhanced T1-weighted images and MRA source images. For accurate interpretation, it is critical to harmonize observed abnormalities across all sequences. Recognize common pitfalls such as age-related vasa vasorum enhancement in the large intracranial arteries near the skull base, slow flow mimicking arterial wall thickening or enhancement, normally enhancing veins that are commonly seen close to arteries, and the effects of therapy on the vessel wall. Always seek knowledge of the broader clinical context of the VW-MR imaging. Communicate VW-MR imaging results to referring physicians along with the appreciation that certain VW-MR imaging findings are well-studied but others (which may still be important) are not yet fully validated. The authors thank Dr. Max Wintermark and the Executive Committee of the ASNR for constructive feedback on our draft manuscript. Disclosures: Christopher P. Hess—UNRELATED: Expert Testimony: various legal firms (medical-legal consulting); Grants/Grants Pending: National Institutes of Health,* Quest Diagnostics,* Cerebrotech Medical*; Payment for Lectures (including service on Speakers Bureaus): Siemens,* Comments: travel and lodging to lecture on neuroimaging for internal research and development at Siemens Healthcare. David Saloner—UNRELATED: Grants/Grants Pending: National Institutes of Health. * Sameer A. Ansari—UNRELATED: Grants/Grants Pending: American Heart Association,* National Institutes of Health. * Bruce A. Wasserman—Patents (planned, pending or issued): Dr Wasserman has a patent pending (No. 13/922,111) for a 3D black-blood MR imaging technique mentioned in this article; however, there have been no license agreements and he has not received any payments related to his patent application. *Money paid to the institution.